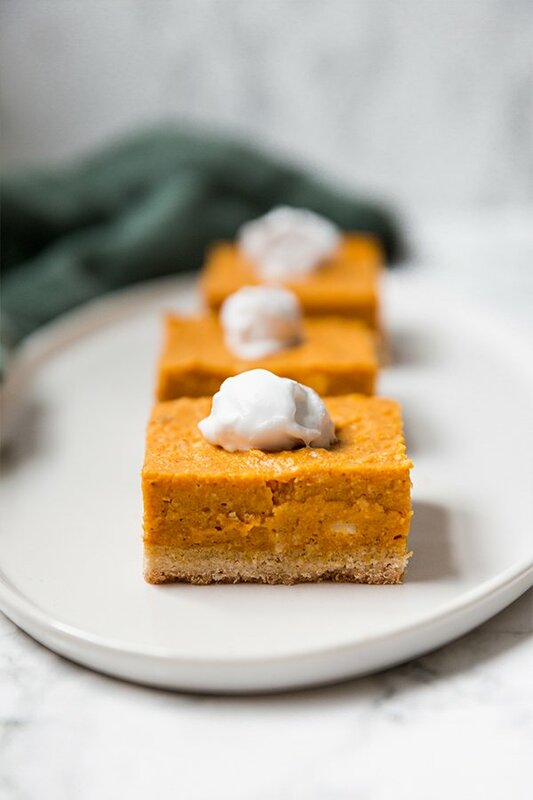 These paleo and AIP pumpkin pie bars are the perfect Thanksgiving dessert! Serve them topped with coconut cream, and you’ve got the real deal. They’re grain free, gluten free, dairy free, egg free and refined sugar-free. Pumpkin pie is such a Thanksgiving must. I ate pumpkin pie every single Thanksgiving for as far back as I can remember. I would put cool whip topping on it and would instantly be in heaven. My dad and I would both keep eating the pie until it was gone, and it rarely lasted more than 24 hours after Thanksgiving. So what I’m trying to say is… I really like pumpkin pie. The first time that I didn’t have pumpkin pie at Thanksgiving was when I first went paleo and AIP. Even though I love to cook and bake, I actually really dislike using pie pans and making my own pie crust. I just focused on making everything else and had to sit one out that year… and the next year… and the next. Not this year. No sir. 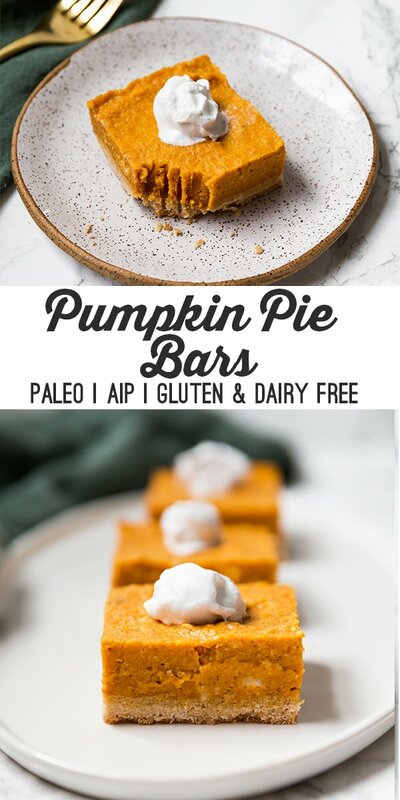 Not with these paleo and AIP pumpkin pie bars! Honestly, why didn’t I think of this before? Why mess with a pie pan and form a perfectly shaped crust when you can just make bars and get all of the same flavors? It’s much easier, much faster, and it tastes just as delicious! These are the ingredient that you need for the crust. The coconut flour and arrowroot together help create kind of a graham cracker crust texture. It’s not too heavy like cassava flour would be, but it’s also not overly crumbly. You can likely swap arrowroot for tapioca, but overall this recipe just isn’t one that conducive to being made coconut free so I would not swap the coconut flour. The gelatin helps as a binder, and collagen cannot be used as a substitute. I use the green can of Vital Proteins as my gelatin source. You’ll also need this for the gelatin egg in the filling. For the sweetener, I think maple adds to the overall flavor of the pie but you can also use honey in either the crust or the filling. This makes the filling for the pumpkin pie. 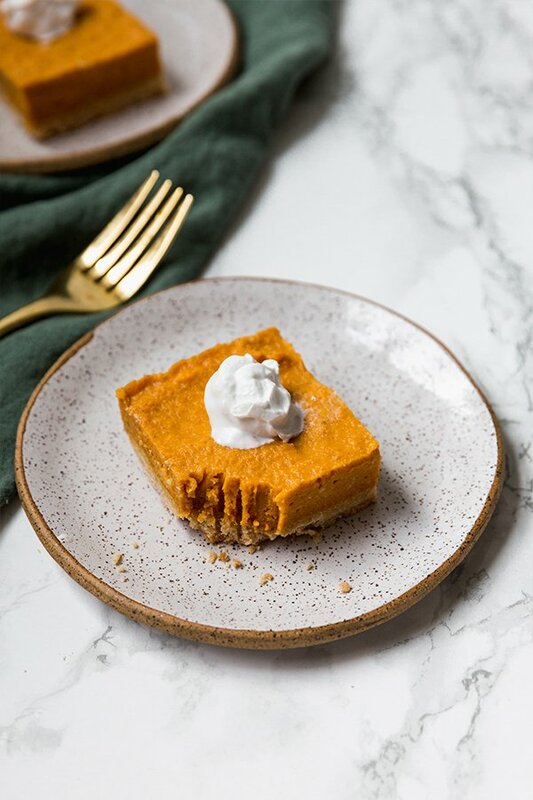 Make sure you use pumpkin puree and not canned pumpkin pie! Alternatively, you can make your own homemade pumpkin puree. The coconut cream can be purchased by itself, or you can just place a can of full-fat coconut cream in the fridge overnight and use the hardened cream on top. Preheat the oven to 350F and line an 8×8″ baking pan with parchment paper lightly greased with coconut oil. Mix the dry ingredients in medium mixing bowl. Stir in the coconut oil and maple syrup until thoroughly combined. Press the crust into the bottom of the baking pan, evenly dispersing it. Bake in the preheated oven for 15 minutes. Set aside to cool completely. 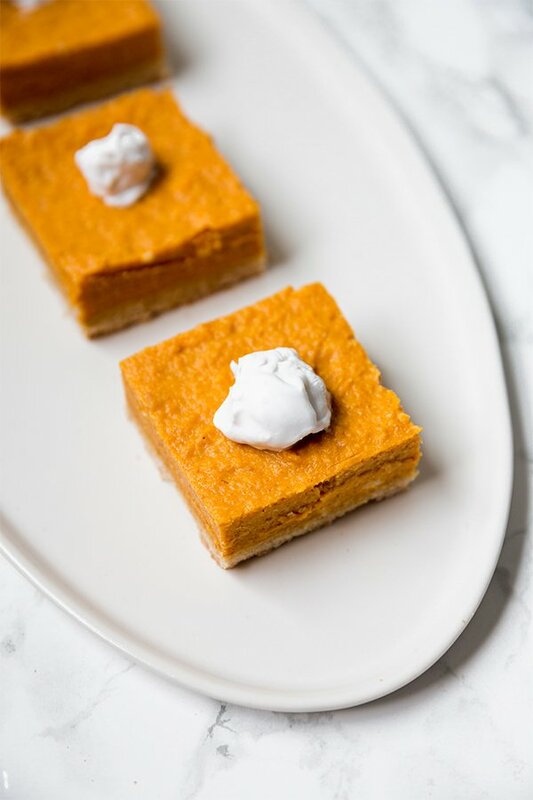 Mix the pumpkin puree, maple syrup, coconut oil, coconut cream, and cinnamon until well combined. Stir to make sure the coconut cream is softened and no clumps remain. Make the gelatin egg by pouring the water into a small saucepan and sprinkling the gelatin over top. Allow it to harden for 2-3 minutes. Set the pot on the stove top set to low heat for 1-2 minutes to allow the gelatin to melt and the mixture to turn back into liquid. Remove from the heat and use a whisk or a milk frother to vigorously whisk until frothy. Pour into the pumpkin mixture and combine. Pour the filling mixture into the baking pan over the crust and use a spoon or rubber spatula to even out the top. Place in the fridge to set and cool for 3-4 hours. Once fully set, remove from the baking pan and slice into 9 slices. Top with additional cinnamon and coconut cream if desired. Hi: Am I missing something? You list gelatin as an ingredient for the crust, but I don’t see it used in the directions. Just curious. Is there a vegan substitute for the gelatin that will work in this recipe? You could use agar agar. I don’t have gelatin but I can have eggs. Can I use that in the filling? If so how many eggs? It’s more like a cheesecake filling so I don’t know if eggs would work… you would need to cook them. What gelatin do you recommend? And is the coconut oil warmed to a liquid form? Vital Proteins is my favorite! I don’t warm it. Is there a substitute for the arrowroot flour? What’s the white stuff on top of the pie? Is it possible to substitute maple syrup? Will it work with applesauce? I do not want to eat so much sugar (maple syrup is just a less bad version of sugar). You can try, but I can’t guarantee it will yield the same result… the consistencies are pretty different. How far in advance can I make this and not compromise the texture? The reduced fat won’t really yield as much cream, but you can try it! These look amazing – going to make for Thanksgiving. Storage / prep question- can they be made the night before, store in fridge? (Soggy crust?) or do you recommend “putting it together” the day of, and allowing the 3-4 hours to set up? For the coconut cream, would the top section of a can of coconut milk that has been in the refrigerator work? I made these for Thanksgiving and they were fantastic. They also lasted a few days stored in the fridge just fine (no soggy crust at all). Thanks so much for such an awesome recipe – I can’t wait to make them again! I made an AIP Thanksgiving and didn’t tell anyone. I made your Roast Turkey with gravy, Cauliflower mashed, the Pumpkin Bars listed here and Apple Crisp, + Brussels Sprouts. Everything was delicious. My first AIP Thanksgiving and it was a success. Thank you for such great recipes. I wasn’t even tempted by the non-AIP foods my friends brought. LOVE THAT! Thank you so much Rikki! Hello. can I use fish gelatin? I don’t eat pork for many reasons. Also can I sub something for the maple syrup? The recipe uses beef gelatin, not pork 🙂 You can likely use fish gelatin as well! You can swap honey for maple syrup. Enjoy! I made this for Thanksgiving and they were easy and delicious! Making it again very soon! YAY! Thank you so much Amy!